On primary election night it looked as if “Go Daddy Girl” Christine Jones may have finally spent enough of her personal fortune to buy a congressional seat in the CD 5 GOP primary, after losing previous elections. But after the last batch of ballots were processed and uploaded onto election computers on Saturday, “Go Daddy Girl” came up nine votes short to state Sen. Andy Biggs, who got his personal fortune by winning the Publisher’s Clearinghouse Sweepstakes. 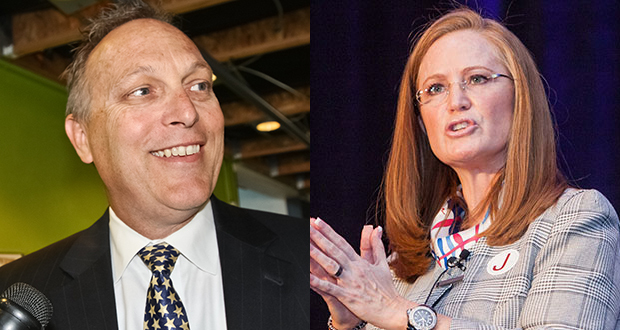 Congressional hopeful Christine Jones, who lost the Republican primary by just 9 votes to state Sen. Andy Biggs as the final votes were tallied early Saturday, is questioning the ballot count and seeking more information about how it was conducted. Jones had been leading the 5th Congressional District Republican primary all week as the Maricopa County Recorder’s Office processed thousands of mail-in and provisional ballots. But on Friday, as waves of new results were posted, Biggs shaved her lead down. In the final tally reported at about 2 a.m. Saturday, a small batch of ballots boosted Biggs to his current razor-thin lead. In total, more than 85,000 votes were cast in the four-way race. The margin between Biggs and Jones is so narrow that state statute requires a recount, which would begin after the Arizona Secretary of State’s Office canvasses the results on Sept. 12, said county recorder spokeswoman Elizabeth Bartholomew. But by mid-morning Saturday, Jones campaign staffers already were meeting with a legal team led by Valley election attorney Joe Kanefield and preparing to start their own review. The campaign sent a six-page public records request to the county recorder’s office seeking communications between staffers and the Biggs campaign, names of voters, reasons for provisional ballot rejections, evidence of so-called “ballot harvesting,” details of equipment malfunctions and other information. Bartholomew confirmed that the office had received the records request and was gathering documentation. At least one major equipment breakdown delayed the vote counting for hours Friday. When a ballot gets stuck in a counting machine and bends or crumples, staffers must remove the ballot and print another one with the same selected candidates to re-run through the machine. On Friday, the printer broke down, delaying staffers from reprinting and counting several hundred ballots. He added that Biggs desires, just as Jones, for the will of the voters to prevail. “We are certain that after the recount, the results will once again show that Andy Biggs is the candidate who they desire to be their Republican nominee,” Deguire said in a written statement. Langhofer excoriated the Jones campaign for raising questions about Biggs’ campaign manager, Cesar Ybarra, being allowed to sit in the tabulation room to observe as a representative of the Maricopa County Republican Party. The party chair, an early Biggs endorser, chose Ybarra to be a party observer. Purcell told Ybarra to leave when the Jones campaign notified her of his role. Her office said there was no way he could have done anything to affect the count. Observers from each party sit in the middle of the room as staffers process ballots and are not allowed to touch ballots or receive information about the vote tally prior to its public release. In addition, the room is monitored by 24/7 video cameras, which stream live to a public website. If the Jones campaign believes there was misconduct, Langhofer said, it should release video demonstrating the behavior. “To smear Cesar’s reputation or suggest that he did something wrong when there’s absolutely no evidence he did anything wrong … is really horrifying,” Langhofer said. This could be entertaining. Pop some popcorn. for the life of me you good government liberals seem to live in a different world. republicans don’t care! liberal whining does no good . you can’t shame them they have no shame. they do respond to fear. why don’t you try it some time. corporate democrats like the clintons want to do business with these devils I don’t! I want to do to kavenaugh and his fellow republiscum what he does to the poor and helpless and would like to do to me and my fellow democrats.how? the latino vote thats how! I don’t know who is more afraid of latinos taking over republicans or old white liberal democrats who will no longer control the az democratic party and keep it white corporate democrat. I will bet you try and run another rich old white fart like fred duval in 2018. the young latinos who organized the road block against the rump rally that made nazi kavenaugh so angry should be running the arizona democratic party not the worthless non enities we have in their now who spend their time fund raising so the paid staffs paychecks don’t bounce! All you have to do is look at two issues Biggs did not wants the Senate to even consider, JTED funding restoration and the Children’s health care issue. Both had almost complete support around the State and in the House and most of the Senate, and he still had to be forced to even allow a vote. This is power abuse and does not deserve to be rewarded with a Congressional seat. On the other hand in Congress he can pontificate all he wants, like the useless Franks , and it will mean nothing. Trends in Emergency Department Use for Dental Problems Among Medicaid Members in ArizonaWill Humble, Division Director for Health Policy and Evaluation, UA Center for Population Science and Discovery. “For Sure Not Tom” certainly does NOT ride around on a Bicycle in Tempe,like I do where those cell phone drivers try to run me down on a daily basis. and you will hear commercials that says it’s illegal to be cell phone drivers. Hey North, I’m on your side, I was explaining why those laws don’t get passed. I’m 100% against phones/texting while driving, and I bike myself. In the end, it always degenerates to ad hominem attacks. To some on the left, conservatives can not only never be correct but are demons with dark hearts and motives. It is hard to imagine what twisted histories and illogical brings a person to such a place but I really feel sorry for such people. They will never be invited to collaborate or contribute to public policy development because they have exiled themselves to a place even people sympathetic to their beliefs don’t want to go. I meant illogic not illogical. Automatic spell correction can be a pain. John, you have perverted free enterprise/capitalism by guaranteeing profits for CCA and others. You have taken away the free market incentive for them to innovate and run their business as efficiently as possible because they no longer need to, the opposite of what you claim to love about Capitalism. You have admitted to corruption when you passed laws preventing anyone from comparing private vs. public prisons. You whine about out of state money, when you yourself take out of state money, and you have no problem with out of state dark money supporting PACs. You have shown your disdain for other human beings and even their children with garbage like SB1070. Eventually this state is going to turn Blue, and we’ll roll back the corruption, and we’ll deal with the damage you’re doing to other human beings. History will not remember you kindly, there will be no statues of you in front of the capital. It is hard to imagine what twisted histories and illogic brings a person such as yourself to see yourself as the good guy. herr kavenaugh the difference is democrats have moral principals (clintons excluded) you have the principals of NAZIS! this will be like when hitler attacked stalin you won’t know who to boo for! I’m with the Meanie and have my popcorn ready to watch the epic struggle between two well-funded Republican candidates fighting to the death for a congressional seat with spin doctors, lawyers, and full crisis management teams. Shades of 2000 with its hanging chads and the Brooks Brothers Riot! As they are both wealthy and powerful people used to getting their way and unaccustomed to hearing the word “No”, this will be very interesting and could go on for weeks. Let the games begin! Biggs is an absolutely disgusting ideologue. He would let the whole State burn down to support his own ideas, regardless of the wishes of the people. I am always amazed at how anti-government fanatics fight so hard go get into government. So when liberals stay true to their beliefs, the ones they campaigned on, it is a profile in courage. When conservatives do it, it is disgusting. Talk about dual standards! Senator, is it your position that it is laudable for someone to sacrifice others on the altar of his/her ideology (or, if we are talking about Republicans, profits)? For the record, my position is that sacrificing others for one’s own beliefs is an act of cowardice. Regardless of whether the beliefs in question can be characterized as “liberal”, “conservative”, or “whatever”. Not at all and disagreeing with liberal policies is not sacrificing others. Surely you are not such an extreme cynic and ideologue. “Extreme”? I don’t know your meaning in the use of that term. “Cynic”? Undeniably. I’ve watched the Arizona legislature, statewide electeds, and others (county and local) here in action for too long to be anything but. “Ideologue”? My “ideology” on social issues is certainly, and proudly, liberal. Having said that, my primary standard when evaluating a policy proposal is whether or not it would serve to strengthen society. Most of what comes out of the Capitol district (in many places, not just in AZ) is all about enhancing the short-term bottom lines of corporations/1%’ers at the expense of the long term health of society as a whole. In the long term, the strongest business environment is created by a strong society; business interests and their pet public officials care nothing about anything further out than the next quarterly report. Example of a policy that weakens society in the long term while benefiting favored moneyed interests in the short term: decimating public education while funneling massive amounts of public money into the pockets of private interests (or in the case of one of your colleagues, public officials using their offices to promote their private interests) (yes, I’m referring to Steve Yarbrough). To be clear, my show your work comment was directed and Kavanagh. Your performance on Diane Rehm’s show was laughable. We can’t compare costs private prison costs but you defend them. You take campaign funds from the private prison industry, but deny they have any influence. You support blindly the ideology “that the private sector can always do better than government” when the for profit sector is a disaster. In prisons, in Southern Arizona mental health service delivery, and charter schools, for profits are a mess for the taxpayers. I heard that. Kavanagh used the example of going to his doctor and paying for treatment to justify stealing from taxpayers to give to Wall Street hedge funds. It was embarrassing to listen to. He asked if it was okay that his doctor made a profit. No, it’s not. Your doctor should be paid for his time, that’s not the same as profit. Profit goes to the shareholders who did nothing to help you on your doctor visit. Free enterprise is not the same as capitalism. Then Kavanagh was on Sunday Square off over the weekend, trying to justify his racist immigration policy. I can’t believe people vote for this guy. Interesting that you bring up campaign promises. Biggs promises to end Common Core when he gets to Congress. Why didn’t he do that at the Legislature? Why did he vote to cut the authority of Diane Douglas, who is truly trying to end Common Core? Participation in Common Core is a state perogative, not a Federal mandate. How can the legislative majority call themselves conservatives? I don’t think you people know what that word means. Did you actually campaign on supporting private prisons, denying studies of their effectiveness, and guaranteeing an occupancy rate? You could never be elected in a competitive district on that platform. Don’t forget that is was Biggs for the last decade in the State Capitol that prevented laws to pass that would of stopped Cell Phone Drivers!!!! I used to work for a cell phone company, one that charged by the minute. Drive time was our biggest money maker, people calling home to see what to get at the store or their friends to find out where to meet up. Anyone who is against limiting cell use while driving has a nice bank account somewhere, maybe a campaign account, with some phone company money in it. There is no other reason to oppose laws against using phones while driving.